Small changes can lead to practices that really make a difference. Here are a few Earth Stewardship East folks that have inspired us. Please contact Merikay at merikays@verizon.net to share your story or that of another local earth steward. Rebecca Clement joined LDS Earth Stewardship while at BYU. When she moved to DC to begin her graduate studies in biology at GWU she joined Earth Stewardship East. She is currently doing research in northern Australia on the effect of termites on wood decomposition. "Once when asked what all of his studies had taught him about God, British biologist JBS Haldane supposedly replied that 'he has an inordinate fondness for beetles'. When introduced to the incredible diversity that exists in insects, I too have been impressed by the colors, shapes and patterns of insects that 'please the eye, ... gladden the heart ... and enliven my soul' (D&C 59:18-19). I believe that Jesus wants us to 'consider the lilies (and insects) of the field' and that He even cares about flies. When we learn about His creations and do our best to fiercely protect them, we are honoring God." Rebecca Clement preparing bags that will hold samples of various Australian tree species. Decomposition rates and causes will be studied over time. Rebecca is the entomologist for this study. Her work for this project focuses on tree eating termites. It is a pleasure to attempt to describe what it is like to get to work on a bike. It fulfills two goals for the day: transportation and exercise. Over the past 10 years or so, I have been in the habit of biking from Gaithersburg, our home, to the Uniformed Services University, my med school. It is at least 14 miles each way, and often I like to increase the trip by taking side roads. I feel stimulated, alive, grateful for many blessings as I roll along. 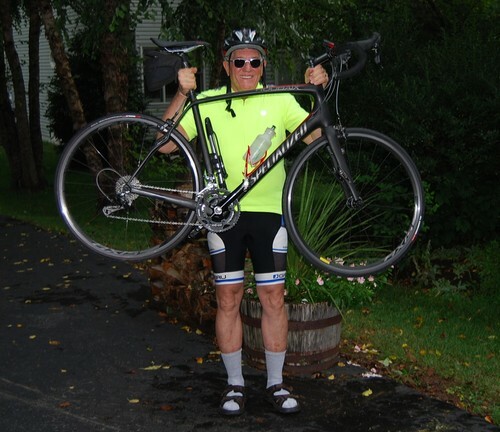 I am now 72 years old but still believe I have some great biking to do. For the past three years or so, I have had a goal of going 5000 miles per year, and each year I have met that goal. and hope to go 6000 miles this year. When I arrive at work, I shower, put on clean clothes, and voila, off to teach, or off to the hospital, or off to some meeting. And in the evening, I get back into the bike clothes and head home. I wear lights, especially in the winter. My record for leaving in the cold was when one it was only 15 degrees. My water bottle was pretty much frozen solid when I arrived. I have warm gear for the winter, similar to a ski outfit. After a few blocks of biking, I am nice and warm. I usually am on the road at 6 a.m. Occasionally I leave for an early meeting, and am on the bike by around 5 a.m. It is great biking that early. Nothing but birds singing, no cars, quiet, serene. I have an occasional encounter with a car, a pedestrian, a squirrel, joggers who wear ear buds and cannot hear me, etc. I keep a close eye out for trouble, and try to be courteous and careful. Most drivers are really pleasant and helpful, but a few shouldn't be driving around bikes. Bikes are like butterflies on the road. Totally vulnerable. I try to avoid cars as much as possible. When the traffic is heavy, I take the trails. My biking would be impossible without Lindy, who keeps me supplied in clean clothes. She feeds me gourmet meals, makes me get enough sleep at night, looks after me in a million ways. I am grateful to be alive and active. My Father passed away when he was 62 of a heart attack. His brothers all died even younger. His father died in his 50's. Everybody had heart attacks. So I have a definite family history. However, I believe that persistent exercise can make a difference, and seems to be working in my individual case. I certainly cannot claim to have all the answers about longevity, but I do know that keeping in shape feels better than getting out of shape. And I can eat anything, and as much as I wish, if I do 28 or 36 miles a day. And perhaps 45 miles on the weekends. One other observation: I cannot run any distance. My legs hurt. My knees hurt. Running just isn't an option. However I feel great the day after a big bike ride. Bikes are relatively gentle of knees. And knees are important! Anyway, that is my rant about bikes! When my wife first approached me about worm composting, I thought it was a pretty weird idea. I fancy myself an environmentalist, but I'm more the hiking, camping, save the whales type than the eat local and be organic, gardener type. I agreed to help build our worm bin (following the instructions here) more as a favor than anything else. I could earn some easy spouse points. "This can't be as bad as the time she convinced me to adopt a dog," I thought. And so with mild skepticism I watched her order a bag of worms on Amazon (the internet is a crazy place my friends), and begin collecting food scraps. We prepared a little bit of soil and shredded paper for the worms, and tossed in our first batch of food waste. A couple days later I opened up the tub to see what was going on. I was shocked by what I saw. Well, not really, because not much had happened. There were some worms crawling on the side of the bin and the food looked a couple days older but that was about it. First lesson in worm composting - they're not that fast. However, this first peek lead to a growing obsession as I checked in too see the worm's progress every couple of days. There was something about the food slowly receding into black mulch, and the grotesqueness of a wriggling mass when you flip over an apple core that sucked me in. Long after my wife lost interest, the worms are still my favorite part of kitchen clean-up. 2- Blend your food scraps. I was against this at first, since I use my blender for MY food, but the worms digest MUCH more quickly if you blend their food first. Food will disappear in 2-3 days as opposed to 7-10. It's also good for the harder things like egg shells that they'll eat, but only if they are already worm-bite-size. 3- They don't seem to like paper. We put some cardboards in, but it just takes so long to disappear that we recycle most cardboard and paper normally. 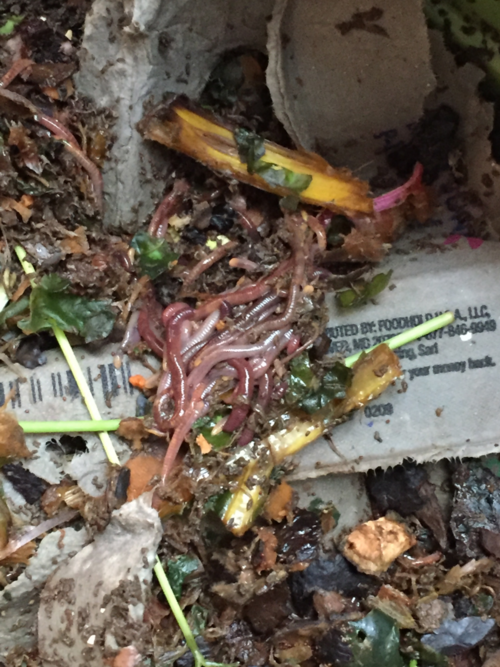 5 - The worms live in an ecosystem - they're not the only things that will make a home in your bin. Fruit flies are an indication of over feeding, so cover with cardboard and hold back on food a bit. Bacteria, fungi, and mold help break down food, and can also become part of the worm diet. If you feel your worm bin is skewing too far towards one population, make some changes in what the environment is like. 7 - (some) People LOVE to check out your worms. It's a great conversation starter to drag the bin out in the middle of a dinner or party and say - "Worms turn our trash to poop!" and then let everyone tell you how amazing it is that it doesn't smell. 8b - Compost harvesting is interesting. We read that if you just put food in on one side, the worms move over there and you can take dirt out of the other side. If it works, only about 70% of the worms get the message. So whatever compost you take out is going to be really wormy - which is not a bad thing, I guess. 9 - They sing! If you open your bin and listen, you can hear hundreds of worms digesting mush. This is incredibly inspiring and has unlocked a hidden ukulele based folk talent I never knew I had. 10 - The bin is completely self-contained. Sometimes when I open the bin the worms are all under the food, sometimes there are worms all over the sides, but in over a year, we've only had one escapee. I played taps, and threw his dehydrated body back in the bin. You can leave the bin where ever you want and no one would even know it was a worm habitat (until you pull it out at your party and tell everyone) You can even go on vacation and let them eat left-overs (or each other...not sure what they do). We were gone for a couple weeks and came back and they seemed fine.